This pepper spray is easy to carry on you at all times. This small half oz. unit will provide about ten 1/2 second sprays to a distance of 8-10 feet. Contains a 17% concentration of 2 million SHU pepper spray. This is 4X hotter than most police use. It is as hot as bear spray. Twist Lock top to prevent accidents. We get this straight from the factory every month. Guaranteed for at least 3 years, expiration date stamped on the bottom of the can. This is the same size that fits most keychain holders. Replace your old pepper spray with this fresh, super hot formula or you can just carry this by itself. Grab a few now at this Special Price for the office, backpack, briefcase etc. The more you buy, the more you save! New, add a test unit (sprays water) for only $2.00 extra. Get the pocket clip for convenient carrying options. 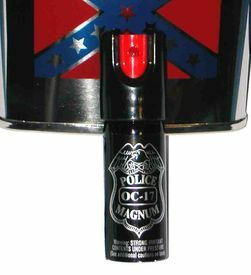 We cannot ship Police Magnum pepper spray to NY, WI, HI, AK, or APO addresses. Pepper spray must be shipped by ground service. No air service allowed. ▪ Why Police Magnum Pepper Spray?